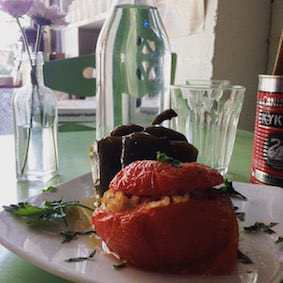 Oven baked stuffed peppers and tomatoes with minced beef; a traditional summer recipe when the peppers and tomatoes are big, tasty and abundant! Take a large oven proof dish. Cut the top of the bell peppers. Discard the seeds. Keep the lids! Cut the top of the tomatoes. Empty the inside –flesh and juices- into a bowl. Keep it, as it will be used later. Keep the lids here too. Chop the onion. Heat a little olive oil in a frying pan, and when it’s hot throw the onion in. Sautee for about 5-6mins in mid-low heat till translucent and soft. Put it aside and in the same pan put the minced beef and brown it well. Add some extra olive oil if the pan feels too dry. Once it is browned, add the onions and the rice, stir well, add the tomato flesh and juice you kept aside earlier and cook till it evaporates. Add the parsley and oregano and season well. Now stuff your peppers and tomatoes with this mix. Cover with the lids, and pour a generous glug of olive oil, a little salt, and some hot water, about half a cup. Cover the dish/tray with a lid or some foil and bake in the oven for an 1hr at 180 degrees. Check after 30mins if the top is browned a little, if it has, turn them over and return to cook, covered. At about 50mins check again, if they aren’t coloured and there is still plenty of water left, uncover the dish, and cook for further 10-15mins till nicely coloured and most of the liquid evaporated.